At the end of 2015 Azamara Club Cruises revealed plans to completely reimagine their luxury boutique ships Azamara Journey and Azamara Quest. Our visit to the revitalised Azamara Quest in September last year gave us an opportunity to discover the public spaces and we immediately fell in love with her fresh, young and modern look. 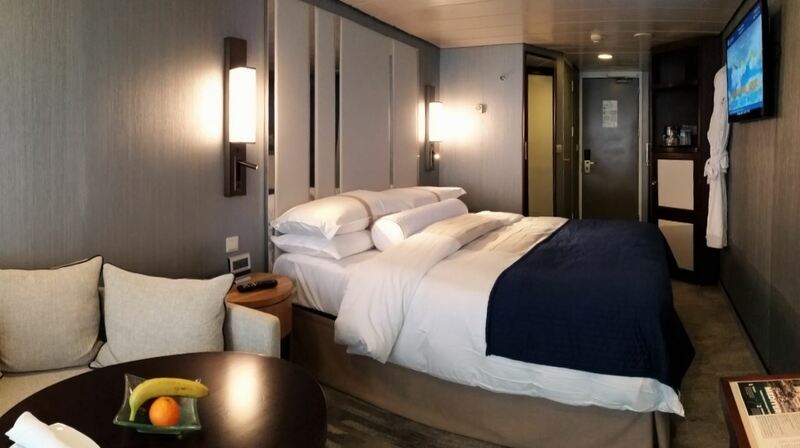 During our cruise from Barcelona to Rome earlier this month, we had an exclusive look inside the new staterooms. 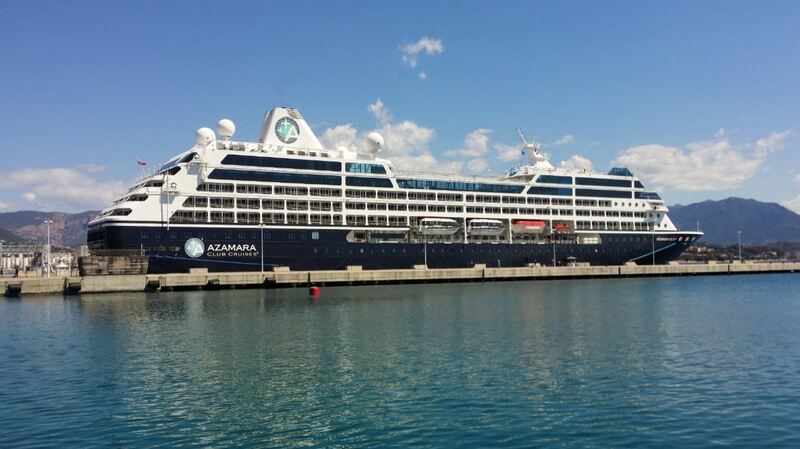 Small is beautiful onboard Azamara Quest. With an average size of 158 Sq. ft. (14,7 Sq. m.) the Interior Cabins are slightly smaller than the Ocean View (170 Sq. ft. /15,8 Sq. 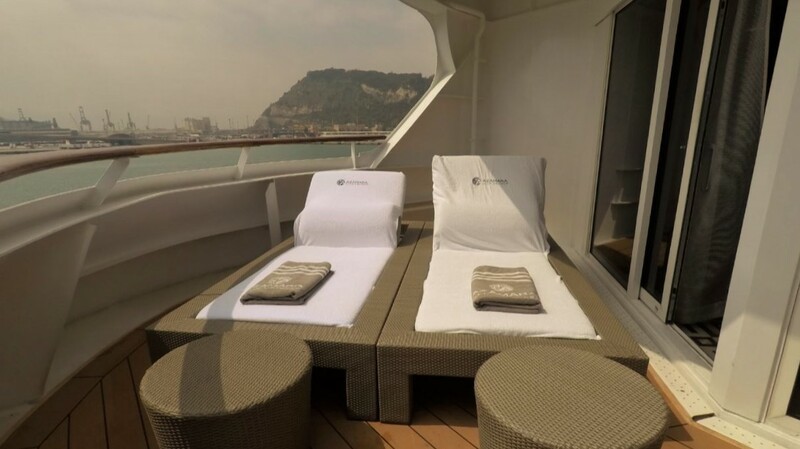 m.) and Veranda Staterooms (175 Sq. ft./16,3 Sq. m. plus 40 Sq. ft./3,8 Sq. m. of the veranda). 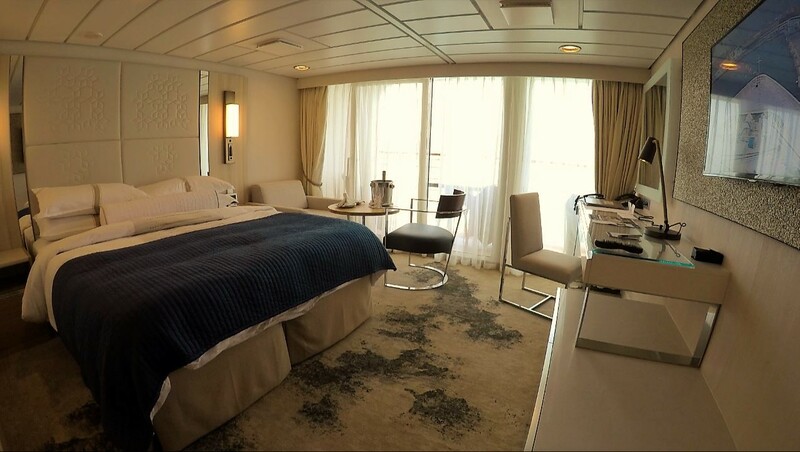 All staterooms feature a sitting area with 40” flat-screen TV, a refrigerator stocked with complimentary water and sodas. We love the fact that the coffee table can be turned into a small dining table simply by adjusting the height and that mobile devices can be charged through the USB-ports which are integrated in the bedside lights. 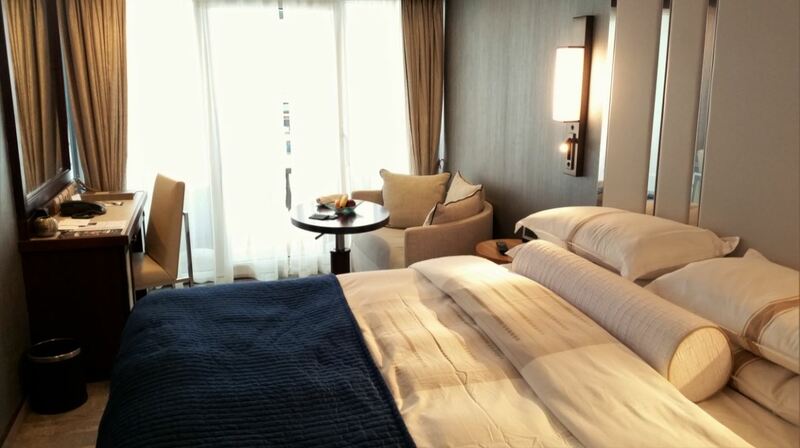 The staterooms come with luxurious bathrobes and slippers, an umbrella and binoculars. 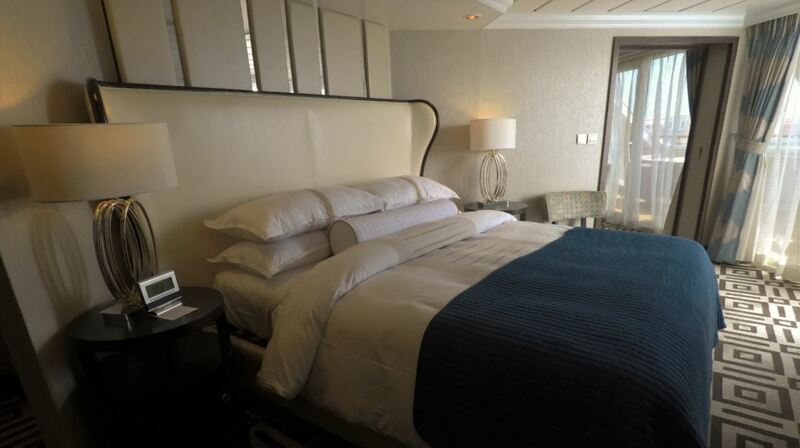 The suite life onboard Azamara Quest. 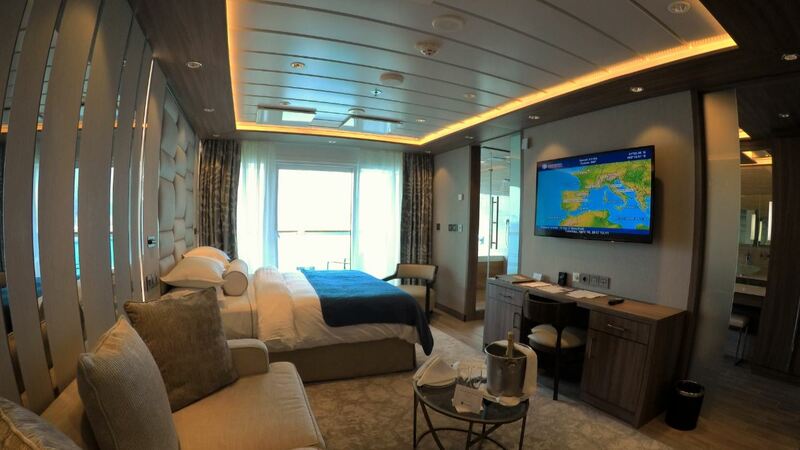 Azamara Quest features 32 Club Continent Suites. Measuring 266 Sq. ft. (24,8 Sq. m.) these suites are decorated in a bright modern style and feature a large 55” flat-screen TV. Guests staying in a Club Continent Suite receive 235 minutes of free internet and unlimited dining in Aqualina and Prime C, Azamara’s specialty restaurants. 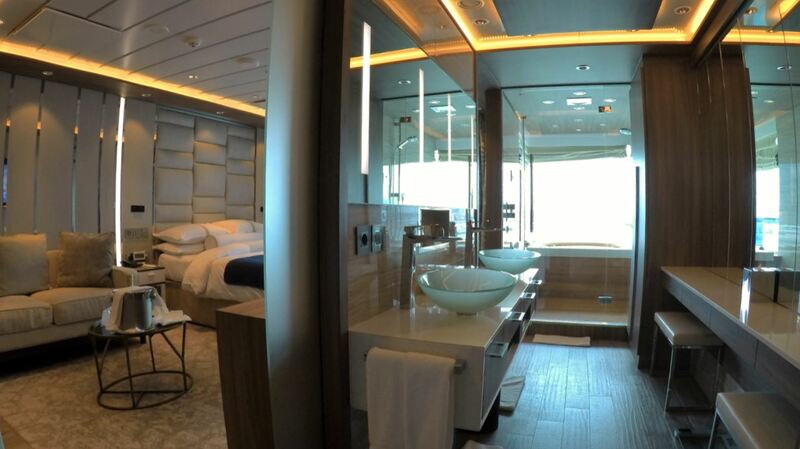 During last year’s revitalisation Azamara introduced the new Club Spa Suites. 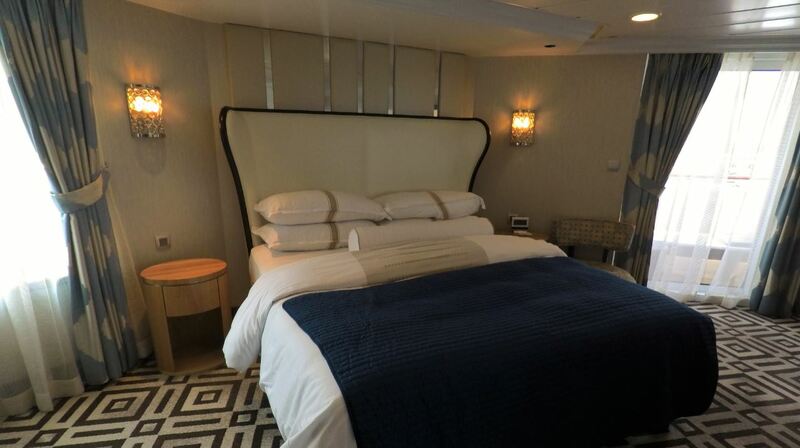 Located next to the Sanctum Spa on deck 9, these marvellous suites measure 414 Sq. ft. (38,5 Sq. m.) with a 60 Sq. ft. (5,6 Sq. m.) veranda. The suites feature a full sitting area with a 55” flat-screen TV and soundsystem providing in-room spa music for relaxation. The galley-style bathroom features double sinks, a seperate rain shower and glass enclosed spa soaking tub. In addition to the free internet and complimentary specialty dining, guests staying in one of the two Club spa Suites receive a $200 Spa credit and the exclusive “Nights in Private Places”. 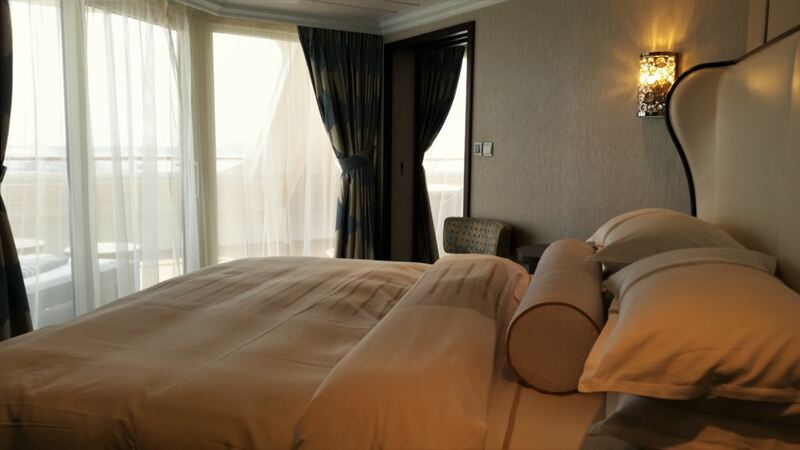 Located on decks 6 and 7, four Club Ocean Suites offer spectacular views from the bow of the ship. Guests staying in the 478 Sq. ft. (44,5 Sq. m.) Club Ocean Suites can watch their favourite movies from the comfort of their King size bed in the seperate master bedroom. 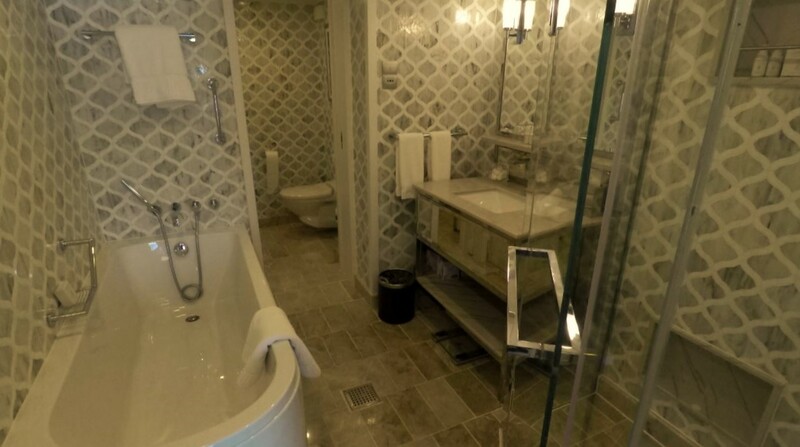 Adjacent to the bedroom is a large dressing room which connects to the luxurious marble bathroom, complete with tub and walk-in shower. 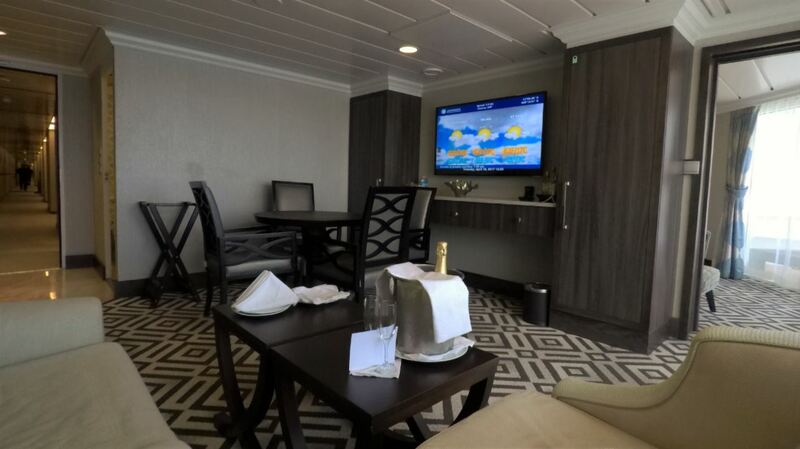 The Club Ocean Suite living area includes a sitting and dining area complete with a 55” flat-screen TV. Glass sliding doors give access to the 173 Sq. ft. (16,1 Sq. m.) balcony overlooking the bow of the ship. Saving the best for last, we visited the Club World Owner’s Suites. 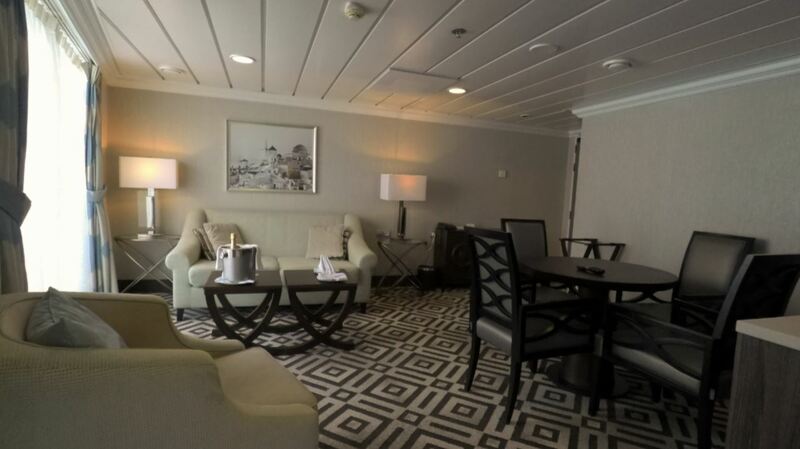 The Owner’s Suites are located at the back of the ship and have a similar floorplan to the front facing Ocean Suites. The six suites offer 603 Sq. ft (56 Sq. m.) of pure pampering in the large master bedroom, complete with King size bed and 40” flat-screen TV, the large dressing area which connects to the marble bathroom, and the spacious living area. The suite’s living area offers a dinning area, perfect for private dinners, and sitting area complete with a large 55” flat-screen TV. The 233 Sq. ft. (21,7 Sq. m.) wrap around balcony features a dining table and two sunbeds. Having explored the suites onboard Azamara Quest we find it difficult to decide which one is our favourite (though we do have a slight preference for the Spa Suites thanks to the hot tub with a view).